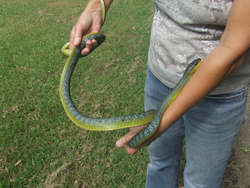 A long, slender arboreal snake, the Green Tree Snake has varying colours according to location. 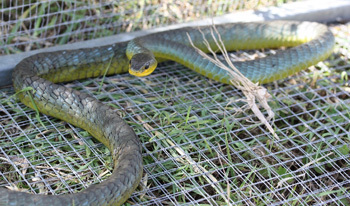 Upper body colours range from olive green, blue green, and dull green, but this snake usually has bright yellow belly scales. Some colour phases include blue spots on the green, or bright yellow spots, depending on location. When threatened, this diurnal snake secretes a smelly oil from its vent glands to make good their escape. Found predominately in trees, or shrubs, he will also inflate his throat to display blue skin between his scales. It will bite, but only as a last resort. Known for their whip like tail, which they use to secure themselves to branches, this species has been known to grow up to 2 meters in length. Average length however, is 1 - 1.5 meters, and I have personally never seen one over 1.5 meters in length. Females produce a clutch of 5 - 12 elongated eggs per clutch. 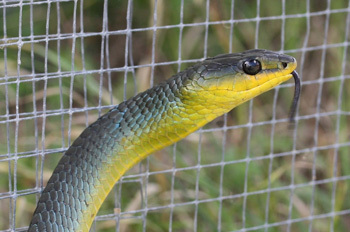 The Green Tree Snake is one of the more adaptable of the Australian Snake species and lives in a variety of habitats from dry to wet, grasslands to dense forests. 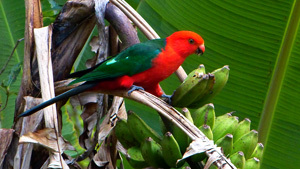 They are found almost all over the Australian main land. It is well known for it's agility, and is mostly found in trees and shrubs. 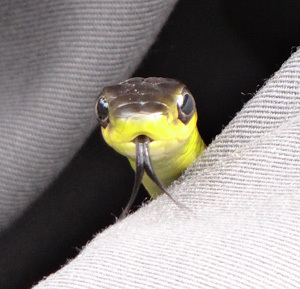 This snake hunts with keen eye sight. Diet consists mostly of frogs, but it is also known to eat small skinks, geckos, and occasionally small dragons.